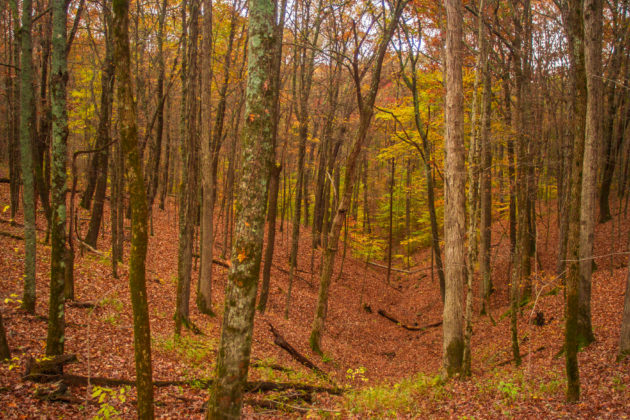 This photo of the Hoosier National Forest by Visit Bloomington captures the beauty of this hilly landscape, similar to the parcel we added at Hardin Ridge. Bigger is better for nature preserves. And in the first four months of 2018, Sycamore completed four projects covering 172 acres that were all additions to existing natural areas. Larger contiguous areas protect more habitat for plants and wildlife, and the core habitat in a larger preserve is also more sheltered from the disturbances found at the edges. In addition, many species cannot survive in an area without a certain amount of habitat protected. Accordingly, adding to existing natural areas is always a high priority for Sycamore Land Trust. And because of your support, we were able to save these four high-priority additions to the Hoosier National Forest, our own Beanblossom Bottoms Nature Preserve, and the Patoka River National Wildlife Refuge. Sycamore’s first project finished in 2018 was the addition of 14 acres to the Hoosier National Forest (HNF) in Monroe County. This wooded parcel sits on a peninsula at the Hardin Ridge Recreation Area, and is surrounded by the HNF and Lake Monroe. The project began over three years ago, when Sycamore staff discovered that the parcel was listed in Monroe County’s fall tax sale. The late owner’s estate had abandoned the property, leaving property taxes unpaid. While the HNF was interested in acquiring the property, they were not able to act quickly enough. So Sycamore stepped in and went to the tax sale auction, and made the winning bid. Winning the bid was merely a first step. Sycamore had to wait for a year before receiving title to the property, a period mandated by state law to allow property owners a last chance to pay taxes owed and reclaim land. Legal notices and a court filing had to be made as well. HNF staff successfully applied for a competitive Land and Water Conservation Fund grant to purchase several hundred acres, including this parcel. With the deed finally in Sycamore’s hands in early 2016, the HNF was able to begin their acquisitions process. All the paperwork was finished this February, and HNF purchased the property from Sycamore. The final step for HNF will be to remove an old shack on the property, the one remaining sign of human occupation on a parcel that has otherwise returned to nature. 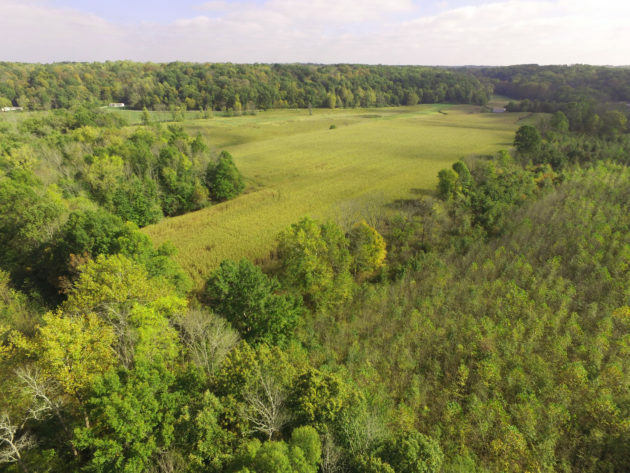 Sycamore’s next project of 2018, an 84-acre addition to our own Beanblossom Bottoms Nature Preserve in Monroe County, had also been in the works for over three years. This key parcel fills in the northeast corner of the preserve, and contains a floodplain field along with neighboring upland forest. We reached out to the landowner at the end of 2014 through a mailing to landowners in our Beanblossom Creek Bicentennial Conservation Area, and several more letters, phone calls, and in-person meetings followed over the next few years. Sycamore understands that selling or donating land is a big decision, and we’re always grateful when a landowner is willing to talk with us. These discussions worked out well for everyone, as we were able to agree on a deal for Sycamore to purchase the land. Because of all the donors who contributed to the Beanblossom Creek project, this important addition will now be protected and managed forever as part of Beanblossom Bottoms. Our third and fourth projects of the year were not marathons but races against the clock to acquire two additions to the Patoka River National Wildlife Refuge in Gibson and Pike Counties. In late 2017 Sycamore had the opportunity to apply for land acquisition funding for multiple projects from the Laura Hare Charitable Trust. We reached out to our colleagues at Patoka, and these two parcels were at the top of their priority list. The 62-acre parcel in Gibson County contains bottomland forest and a frequently flooded field bordered by the refuge and the Patoka River itself, and the 12-acre parcel is all forested and borders both the refuge and the river. The landowners of both were eager to sell. A timber harvest was already scheduled on the larger property, threatening trees that Patoka staff said were larger than any currently on the refuge. The Laura Hare Charitable Trust quickly approved the grants, making it the third and fourth times that the Trust has helped Sycamore add land to Patoka River NWR. Sycamore contacted the landowners right away, and made deals for both properties before timbering progressed on the larger tract. Acting Refuge Manager Heath Hamilton also quickly secured a grant from the Wild Turkey Federation to cover remaining purchase costs. Sycamore can now transfer the land to the refuge. Next spring the field on the 62-acre parcel will be planted to bottomland hardwood forest, thanks to a grant from the Alcoa Foundation’s and American Forests’ Partners for Trees Program. This parcel will be used to complete the matching requirements for a $1 million North American Wetlands Conservation Act (NAWCA) grant. Eight conservation partners including Sycamore were involved with the grant, which helped protect over 3,000 acres at Patoka River NWR.